The town of Avon believes it may be. 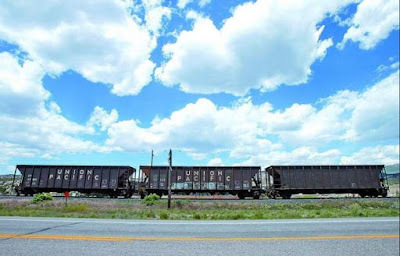 In an era where coal is assuming new levels of dominance as an energy source, Union Pacific is planning on storing 500 coal cars in the yard at Minturn, the former helper terminal for the "rail banked" -- read: not quite abandoned, but almost -- Tennessee Pass route between Pueblo and Dotsero on the Colorado River. While this could be part of a power play to the Colorado Public Utilities Commission to rub out two grade crossings in a planned development in Avon, UP officials claim that such talk is "a very bad rumor." The town of Avon, playground to the rich and famous, has already made it illegal for a railcar to stop in a grade crossing. Next week, on June 13th, the town of Avon plans to make it illegal to park railcars anywhere in their city limits for more that two days. It's called a nuisance law, and it's designed to keep the town looking nice. It's also a symbol of the conflict of two different industries that have come to be largely at odds with each other. Only 120 years ago, your town could die if you didn't get a railroad. Today, it could die if the railroad stays. Minturn, just down the road from Avon, desperately wants to join her sisters as "resort town." Who's holding her back? Why the big, bad railroad, of course. If the UP stores it's railcars there, then in the words of one Edwards resident, Kyle Bolio, "Minturn's going to look like a dump." Is it really that bad? Towns like Colorado Springs, Winter Park, and Glenwood Springs have rails that sing with traffic, in most cases running right through the center of town, and it doesn't seem to be holding them back on property values or tourists. Could there be something else afoot in the Colorado Rockies? Are new residents suffering from ferroequinophobia? Are their concerns about occasional train noise and the danger to children near the right of way any more valid that towns and cities that see 20 trains per day? The good news is that UP never fully abandoned the Tennessee Pass right-of-way. Had they done so, 7-story condos would have gone up the next week in that little valley. Railroads continue to be the lifeblood of our nation. The moment a line is abandoned, it is lost forever. Then when the need arises for a rail line, as it inevitably will with continued growth of the American economy, there won't be one there to reactivate and use to ship the needed commodities. No, the UP needs to hang on to Tennessee Pass, a key crossing of the Continental Divide, if only to stick in there as a standby line for the potential future of Colorado and the West.